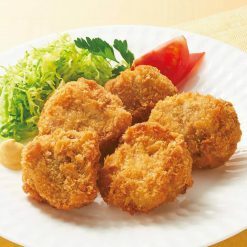 Tonkatsu is a Japanese dish which consists of breaded, deep-friend pork cutlets. 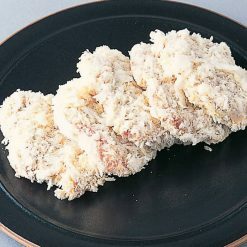 The tonkatsu in this package was made with pork filet and breading, using raw panko. By refining the panko through further grating, the tonkatsu is crunchier and less oily than our brand’s previous version. Packages come in 130g packs (5 pieces of tonkatsu each). Product can be kept frozen up to 9 months. Cooking times listed in the instructions are approximate. As for the amount of oil, please exercise caution, depending on the quantity that is being cooked. When cooking, please pay attention not to get burned, because the equipment and the product will get very hot. Tonkatsu is often served with thinly sliced cabbage in Japan. It is also possible to add sweet and salty fried eggs to tonkatsu, place it over a bowl of rice and serve in another dish called katsudon. Thaw the tonkatsu in the refrigerator before cooking. Remove from the refrigerator 30 minutes prior to cooking, and leave at room temperature. Finally, the tonkatsu should be fried in oil at 170 ℃ for 2-3 minutes, until golden brown and the meat floats in the oil. Make sure to cook thoroughly and turn the meat once or twice. Cooking times listed in the instructions are approximate. As for the amount of oil, please go easy, depending on the quantity.When cooking, please pay attention not to get burned, because the equipment and the product will get very hot.Deep fried tonkatsu condiments include ketchup, soy sauce, Worcestershire sauce and mayo. If interested, we recommend the Ikari pork cutlet sauce and QP mayonnaise. This product contains pork (Canadian), (including some of the raw milk) bread crumbs, wheat flour, rice flour, egg powder. This product is not suitable for anyone with allergies to egg, milk, wheat or pork.